On any given Friday morning during the spring semester, Temple Law School bustles with the usual business of a law school: classes, meetings, study groups, and lots of reading. But March 29, 2019 was not business as usual. On this day, Klein Hall played host to a services and career fair for returning citizens organized by Players Coalition and Impact Services. At the fair, 40 returning citizens met with 20 social service organizations, among them the Temple Legal Aid Office; and more than 50 employers who were prepared to hire qualified candidates on the spot. As of noon, the halfway point for the event, Impact Services reported that 17 hires had been made. Players Coalition is an independent 501(c)(3) (charity) and 501(c)(4) (advocacy) organization, working with professional athletes, coaches and owners across leagues to improve social justice and racial equality in our country. The work is focused on three key pillars: Police & Community Relations, Criminal Justice Reform and Education & Economic Advancement. Players Coalition is solution-oriented, and members invest significant time and resources to educate themselves on various issues impacting their communities to identify where their influence can have the greatest impact. 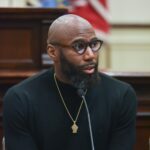 In 2017, the Players Coalition was co-founded by NFL Pro-Bowl Safety and 2017 NFLPA Byron “Whizzer” White winner Malcolm Jenkins and retired wide receiver and NFL 2015 Walter Payton Man of the Year winner Anquan Boldin. Players Coalition continues to grow in numbers of ambassadors with the collective goal of making an impact on federal, state and local levels through advocacy, engagement and providing resources. For more information follow @playerscoalition on Instagram and Facebook and @playercoalition on Twitter. Impact Services is a non-profit organization that empowers people in need to attain the hope, motivation, and skills necessary to reach their fullest human potential and highest level of personal and family self-sufficiency. Impact Services has worked with many of the attendees to help prepare them for release and has provided pre-event job training and case assistance for each participant. Pictured above, left to right: Julie Wertheimer, Darrell Briddell, Darren Thompson, Rodney McLeod, Malcolm Jenkins, Keir Bradford-Grey, Dorothy Johnson-Speight.